How Are Diamond Carats Priced? >> How Are Diamond Carats Priced? When talking about jewelry, and specifically diamonds, we hear the word “carat” a lot, but what exactly is a carat? For the record, a carat refers to a unit of weight of a given gemstone, such as a diamond, where one single carat is equal to 200 milligrams, or 0.2 grams. The actual definition of a carat has changed over the years, but was established at its international standard in 1913. 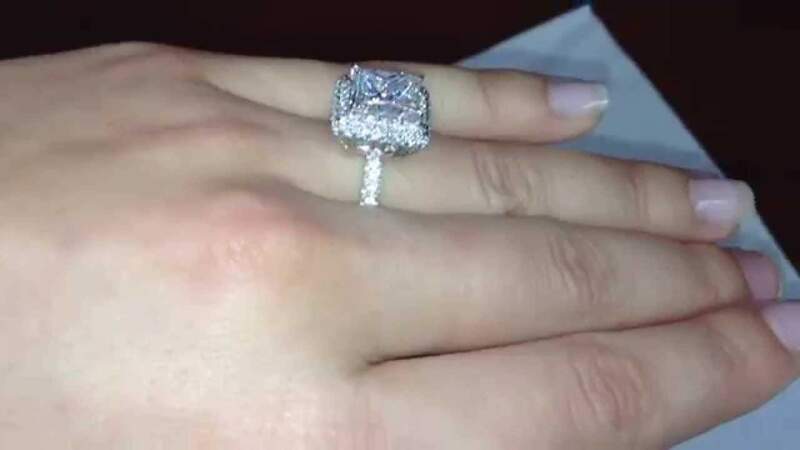 If your piece of jewelry has more than one diamond, then you need to look at the total carat weight of the piece, taking into consideration all of the stones included in that piece, since they are measured cumulatively. Diamonds, for instance, come in all different shapes and sizes, and can measure anywhere from a small fraction of a carat, to several carats. 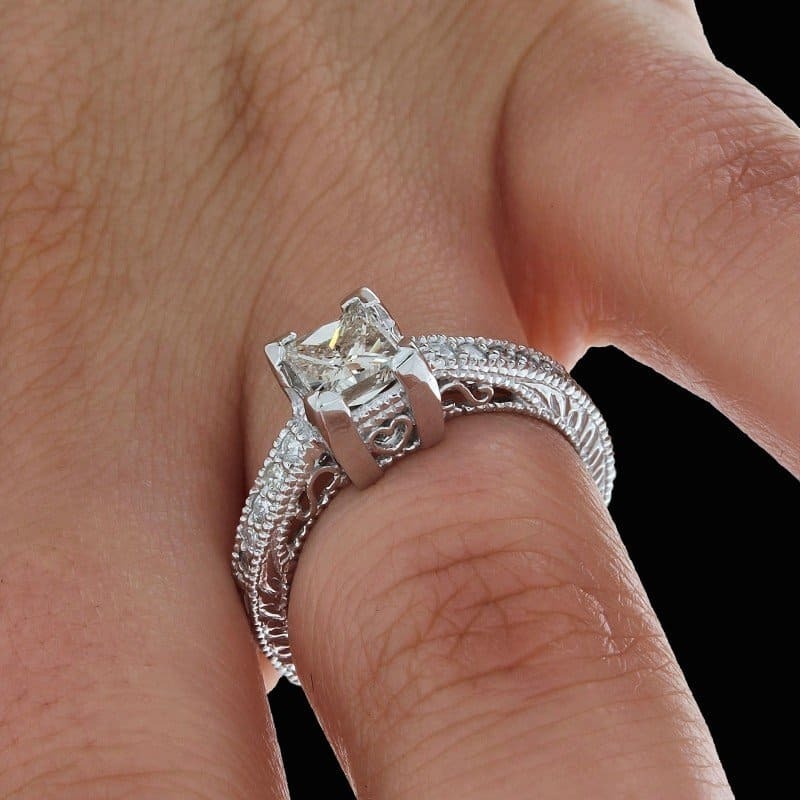 What we find particularly interesting is the way carats are priced, because it’s not what you’d necessarily expect. Say you have two 1-carat diamonds, and you have one 2-carat diamond. You might think they’d be the same price, but that’s not how it works. Because larger stones are more rare, they quickly increase in price, costing much more than two single carat diamonds of the same weight. So, if you inherit a bag of small diamonds, yay! But if you inherit one giant diamond, then HOO-RAY! Also, the more clear those diamonds are also increases their value, since diamonds are valued for their clarity. When diamonds reach that 1-carat mark, you will find the price really starts to rise, and as the weight of the stone increases, the price really starts to go up. If you are trying to figure out the carat weight of a diamond, particularly if the cut is a round brilliant cut, you should be looking at the stone’s diameter. 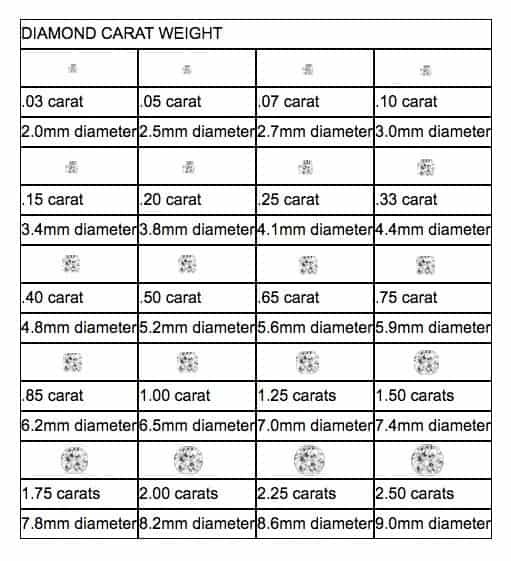 Below you will find a chart that shows what you might expect to find when examining the carat weight of a diamond, in relation to its diameter. This chart is simply a guideline, and meant for educational purposes only. Also, it only applies to round cut diamonds, not other cuts, and not colored gemstones since their density is different. Got it? Great! Here is a video featuring diamond expert Josh Fishman you can watch that will explain things in regards to diamond carat pricing a little bit further, because surely as you go along, you might have more questions. In this video, John Fishman talks about some excellent points in regards to certain aspects of diamond carat pricing that are bound to confuse some consumers. 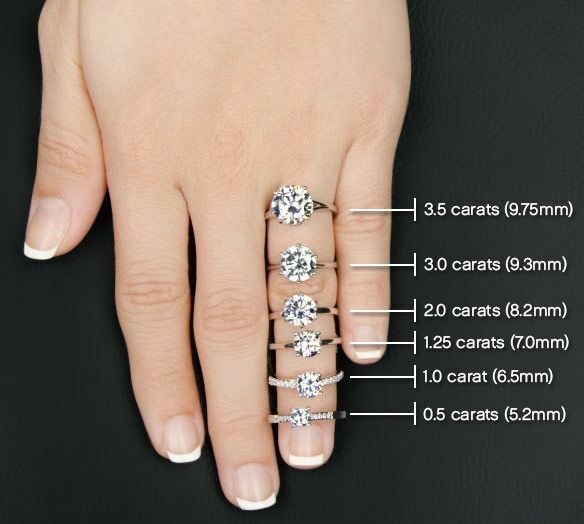 For instance, if you have two diamonds of different size that are the same cut and quality, but the price per carat of each diamond is different. What does this mean? Does this mean that the smaller diamond is of lesser quality? As John explains, the reason you might find a smaller diamond at a lower price than a larger one is because of the rarity of the size of that diamond, and not a difference in quality by any means. When looking at wedding rings, this can get confusing for some consumers, because the price will depend on not just the overall carat weight, but also the weight of the individual diamonds found in the piece.